Before the late 1980s, flashlights, wrist watches and children’s toys were the predominant battery powered electronic products. Today, battery powered products are found in nearly all areas of our personal and professional lives. Whether the product is a cell phone, laptop computer, pace maker, hearing aid, power drill or any one of the new types of products made possible by today’s battery technology and low power electronics, long battery life is key to the product’s marketplace success. Just as the electronics and battery technology of 20 years ago are not suitable for developing these products we have today, the tools engineers used 20 years ago for measuring current and power consumption are not suitable for developing these products. Measuring the power used by the complex products of today can be just as complex as the products themselves. In many of these products the “low” power consumed by a microprocessor and related circuitry can have a bigger impact on battery life than the “high” power consumed by the circuits specific to the main function of the product. That makes reducing the power consumed by the microprocessor and other circuitry the critical area for improving battery life. The tradition methods for doing power measurements face many issues in accurately measuring these low current levels and can also be very time consuming and error prone. The current draw of a typical battery powered product can vary from a few microamps in a deep-sleep mode to hundreds of milliamps when fully active. Depending on the product’s function, current draw dynamic ranges from 10,000:1 to over 100,000:1 are not uncommon. Such a wide dynamic range is nearly impossible to deal with using the traditional method. A sense resistor sized to give enough voltage drop to measure nanooamps on a scope will drop enough voltage to prevent the circuit from operating when the current changes to the milliamp range. Even at power levels of a few milliamps the voltage drop across the sense resistor can be so low that it is difficult to measure and accurately assess the information presented on an oscilloscope screen. With voltage drops of a few millivolts the accuracy of the measurement can be impacted by the resolution and accuracy of most oscilloscopes. Current levels can be very transitory, changing rapidly and remaining steady for periods as short as a few microseconds. The current level can also vary by up to several orders of magnitude at these high rates of change. These factors make for a very complex waveform to analyze with any degree of accuracy. While the engineer can analyze this complex waveform on an oscilloscope screen and arrive at a current draw guestimate, the result is rarely accurate and doesn’t provide an accurate measure of power consumed over time. A simple product like an MP3 player may have several power level states while something as sophisticated as a cell phone or laptop computer can have dozens of power level states. These states reflect what the user is doing with the device and can typically last from a few seconds to several hours. Each state may have dozens of different power consumption levels that must be analyzed. The sense resistor and oscilloscope method is strictly a manual process. Even if each individual power consumption level can be measured accurately, it is impossible to get a true measurement of power consumed over the time span of each and every power level state a complex product has. The traditional method provides a snapshot of a current waveform which may be composed of hundreds or thousands of data points. Each individual data point must be taken into account for an accurate current measurement. Battery voltages tend to fluctuate under load so a power measurement also requires a voltage waveform to be taken simultaneously with the current waveform and the voltage and current data for each sample paired together for power calculations. The scope screen image below illustrates a number of these points. The waveform represents the current draw on the battery of a Bluetooth Low Energy device with the sense resistor sized so that 1mV equals 1mA. The thick portions of the waveform don’t allow for an accurate measurement of the current draw and the jagged, sloping edges make it impossible to accurately assess the power consumed during this event. To further complicate the task of calculating the power consumption, the time between points A and B can vary from 3mS to almost 7mS. This particular event occurs every 100mS for as long as 30 seconds. That means in calculating the power consumed during this series of events, the measurement error would be multiplied by as much as 300 (not including the error due to the variations in event duration). In short, the sense resistor and oscilloscope method can provide accurate instantaneous measurements in a static environment with consistent steady-state current flow. However, this method fails to provide accurate measurements in a dynamic and rapidly changing environment and does not have the ability to measure power consumed over time. So what is needed to accurately analyze current draw and measure the power consumption of today’s modern electronic products? Before getting into that, it’s important to mention the differences between current draw and power consumption. Besides the obvious difference that measuring power also requires measuring voltage, current draw is an instantaneous measurement while power consumption is measured over time. Measuring power consumption places additional requirements on an instrument in terms of processing horsepower, buffer memory and current measurement accuracy. Specific requirements will vary depending on the nature of the product to be analyzed but the items listed below are the important characteristics to look for in a power measurement instrument. Wide dynamic range – As indicated earlier, the extremes of current draw at full power and in deep sleep can be several orders of magnitude. Consider a hypothetical battery powered product with a WiFi interface. While transmitting the current draw is 500mA and when in deep sleep the current drops to 50uA. That difference is four orders of magnitude or a dynamic range of 10,000 to 1. To accurately measure the 50uA current you would want resolution at least in the 10uA to 5uA range which increases the dynamic range to 50,000:1 to 100,000:1. The newest generation of low-power microcontrollers have sub-milliamp operating currents and deep sleep currents in the low nanoamp range, increasing the dynamic range just for the micro to over 100,000:1. High resolution & accuracy – One of the main deficiencies the oscilloscope has in this application is limited resolution. A typical mid-range scope utilizes a 10-bit A/D converter and 12-bit A/D converters are generally found only in expensive high-end scopes. An A/D converter’s resolution doubles for each additional bit so a 12-bit A/D has 4X better resolution than a 10-bit A/D. 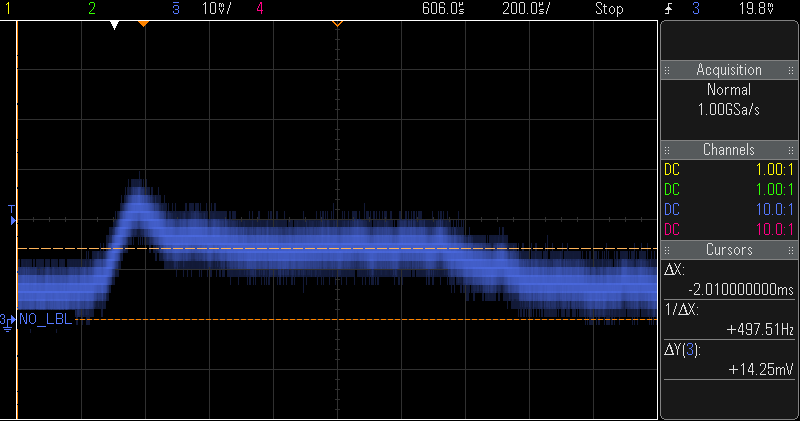 Assuming the 500mA transmit current in our example produces a signal covering the full range of the scope, the resolution of a 10-bit A/D is 488uA and even the 12-bit A/D resolution is 122uA, both far above the 50uA minimum current of our product. A 16-bit A/D would have 7.6uA resolution which might seem good enough but still has as much as ±15% error for the 50uA current we need to measure. High bandwidth – Bandwidth requirements will vary dramatically depending on the functionality of the product being analyzed. The current draw of a microcontroller won’t vary much from clock to clock or instruction to instruction so multi-megahertz bandwidth isn’t necessary for most engineers. The micro’s current draw can vary considerably depending on what internal peripherals are active so sufficient bandwidth is needed to analyze the shortest events the firmware has to deal with. Large sample buffer – Instantaneous current measurements may only need a few thousand samples to display but analyzing the current draw for various power-level states a product may have can require millions of samples collected over seconds or minutes. Storing voltage and current measurements for each sample effectively cuts in half the number of samples that can be stored. Bigger may not be better when it comes to sample buffer size. A large sample buffer combined with high bandwidth can produce a LOT of repetitive, un-interesting data so the measurement instrument needs a means to find areas of interest on a waveform or qualify the data being recorded to make effective use of the large buffer. Wide perspective – Even a super accurate current measurement is of little use without knowing what the circuitry and firmware are doing when the measurement is made. At times it would be beneficial to be able to see the current draw of the micro and that of another circuit or on the battery at the same time. Being able to see digital signals along with the current waveform can not only provide context to the current waveform but also provide a means to trigger current waveform acquisitions or qualify the acquisitions to minimize the amount of useless information being stored in the sample buffer. Two and four channel scopes can provide some of this capability but more inputs and logic analyzer like triggering and qualifying capabilities allow an engineer to spend more time analyzing waveforms instead of looking for events to analyze. 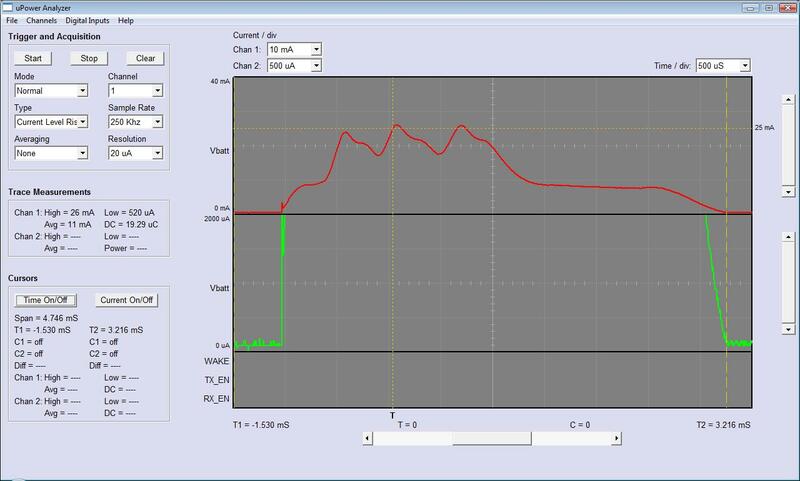 Analysis features – As the current waveform scope screen image showed, accurate current instantaneous measurements alone won’t ensure accurate power consumption over time measurements. One of the major factors in the inaccuracy of measurements made the tradition way is the human element. The task of converting the current waveform to a power consumption measurement must be automated and calculated on a per sample basis in order to achieve an accurate result even for a single event. The instrument should also be able to provide an accurate power consumption measurement over periods of time that may exceed its sample buffer size. What About Traditional Current Probes? There are times when an oscilloscope would be adequate assuming accurate measurements could be taken. Unfortunately, the vast majority of current probes on the market today are not capable of measuring the low current draw of most modern microcontrollers while they are running, much less their sub-milliamp sleep mode currents. The “precision” low current probes from Tektronix and Agilent generally have resolution in the 1mA to 10mA range while 100mA resolution and minimum currents of 500mA or higher is more common. Both of these companies have new low current probes with power measurement capabilities but these probes typically cost over $3,000 and have proprietary interfaces requiring them to be used with higher-end scopes from the same company to utilize all of their features. The µCurrent Probes from CMicrotek will work with any scope with a standard BNC probe connector and provide resolution as low as 1nA. CMicrotek has developed the µCurrent ProbeTM to simplify and improve the accuracy of taking low current measurements when using an oscilloscope is adequate. Most of today’s digital oscilloscopes utilize 8 or 10 bit A/D converters and as a result have fairly poor accuracy when measuring voltages below 1V, where most current measurements are taken on low-power devices. The µCurrent Probes employ low value precision sense resistors and a high-gain amplifier chain to amplifier the voltage drop across the sense resistor into a range where the oscilloscope can measure the voltage more accurately. Both of the waveforms below were taken using the same scope, a member of a popular line of MSO scopes from one of the leading scope manufacturers. The waveform on the left was taken using the "standard" probe for the scope and the one on the right with the CMicrotek µCP100TM current probe. 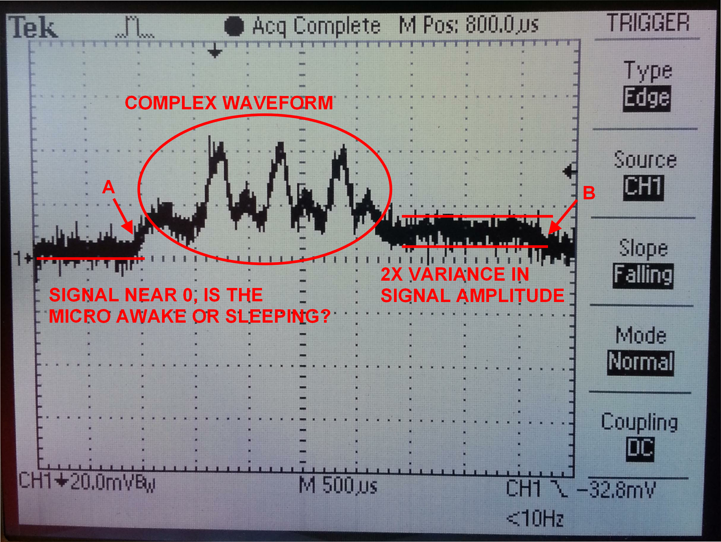 The waveforms show the current draw from a lithium-polymer battery for an 8-bit micro as it wakes up from a sleep state, performs a timer based background task and then returns to sleep. 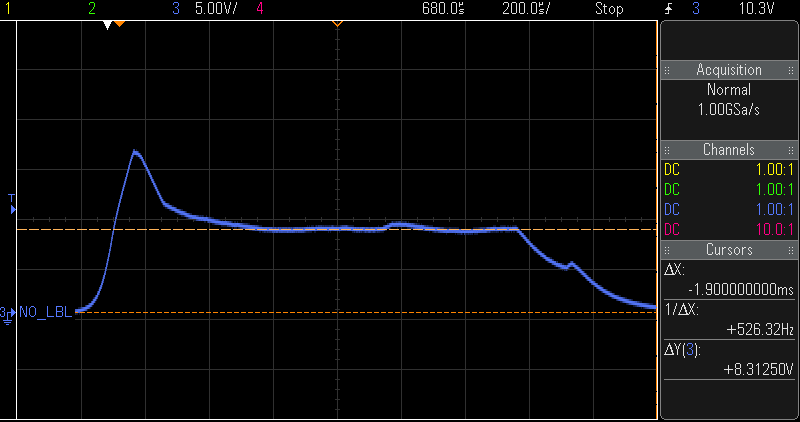 This example illustrates the importance of amplifying the current waveform so that it can be displayed and analyzed more accurately as with the µCP100 example (the measurement error shown represents the scope’s measurement error at the displayed volts/division). Given the measurements with the "standard" probe in the example above (operating current 200% too high and sleep current over 10X too high compared to the micro’s specs), an engineer could spend several very frustrating weeks trying to solve a power consumption problem that doesn’t exist. Even worse, if the measurements were equally wrong on the low side a company could ship a product with half the battery life claimed for the product. CMicrotek is also developing the µPower AnalyzerTM to meet power measurement needs of today’s low-power product developers. The µPower Analyzer replaces the engineer and oscilloscope with high-speed precision electronics to accurately measure and analyze the voltage fluctuations across the sense resistor. The µPower Analyzer is capable of taking measurements hundreds of thousand times per second with resolution from 64 to over 256 times better than a typical mid-range or high-end oscilloscope. The µPower Analyzer simplifies taking instantaneous current measurements and also provides the ability to accurately measure power consumption over time, whether that timeframe is microseconds, minutes or days. The µPower Analyzer connects to the board under test and to a PC via USB. The µPower Analyzer Windows app uses a familiar scope-like interface so engineers can be productive with the µPower Analyzer immediately. Being a Windows app, screen shots can be taken for design documentation, trace files can saved for archival purposes or emailed to co-workers and trace data can be exported in CSV format to be imported into other Windows programs. The µPower Analyzer screen shot below shows the current waveform for the same event as was shown in the scope screen shot earlier. The measurement circled in red in the “Trace Measurements” shows a discharge rate in coulombs of 39.73uC for this 10mS segment of the red current waveform (the green trace is a zoomed in version of the red trace). To thoroughly analyze the waveform on page 2 could easily take most of a day and would require capturing many traces of the waveform to get anywhere close to an accurate “measurement” and even the most thorough analysis would be flawed due to the inaccuracy of the scope. The µPower Analyzer provides a significantly more accurate measurement in a matter of seconds. 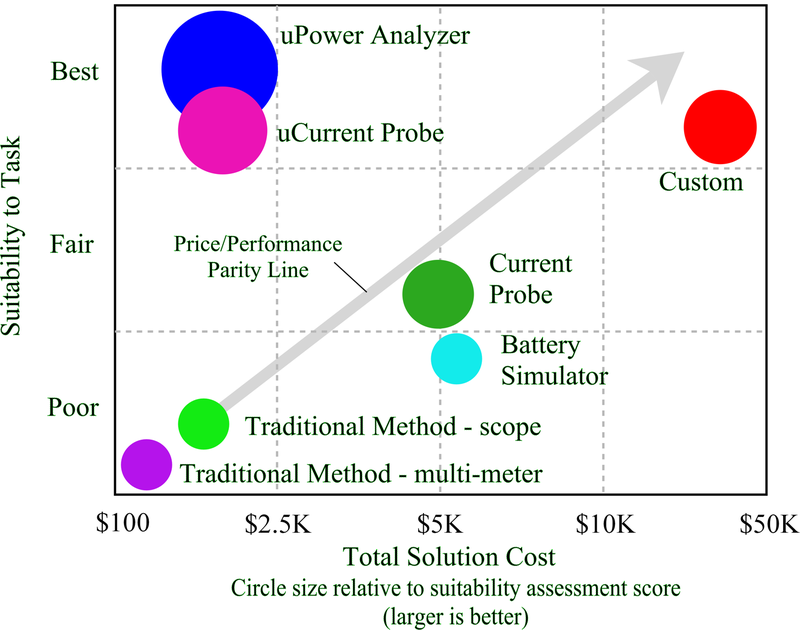 The graph below compares the price/performance of the µPower Analyzer with other techniques for measuring current and power consumption. The µPower Analyzer is a game changer in low-current measurements, providing a superior solution at a price not significantly higher than the least suitable approaches. The CMicrotek products were developed based on over a decade of experience developing battery powered and other low power products. The µCurrent Probe is available now, the µPower Analyzer is on schedule to go into production in Q3 2015.